Nsefu Camp offers guests on their Zambia safari holiday a range of African safari activities to enjoy. Guests staying at Nsefu Camp during their Zambia safari holiday can look forward to a variety of activities. Join an exciting bush walk or game drive. Game drives are offered early morning, afternoon and night. The night game drives are great for spotting nocturnal animals. Some of the African game guests can spot include Wild Dog, Lion, Spotted Hyena and Impala. The area is also ideal for birding enthusiasts. There are over 400 different bird species for guests to spot. 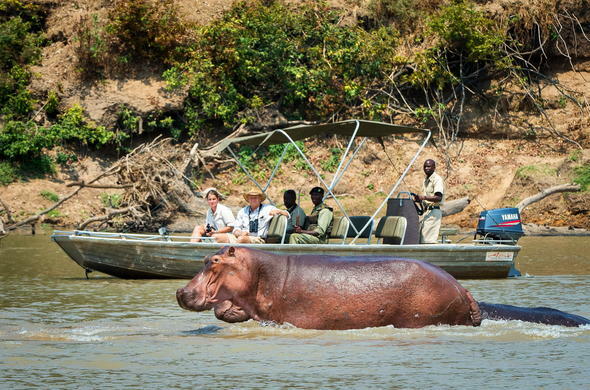 Experience a tranquil boat cruise on the Luangwe River. Spot game or just relax and watch an African sunset. Guests can also visit the Kwaza village. Learn more about local culture and interact with the friendly locals.